It’s good to be back home after a week away attending two conferences, but it was well worth it. After hanging out with some of the sharpest minds in Technical Analysis I decide to “amp up the geek level”. Please bear with me as I’ll try to keep it straight forward. The chart below is of the NASDAQ Composite. I like it because it’s a broader index of stocks, not just the “big guys”. The one on the left is Weekly, the one on the right is Daily (double-click on it to enlarge). On a Weekly time frame / big picture we note that we may have had a Buying Climax (BC) in late March. If so, we are current in an Automatic Reaction (AR) mode; this is the first move counter to the move up. Note that the lower Trendline has not been broken; yet. 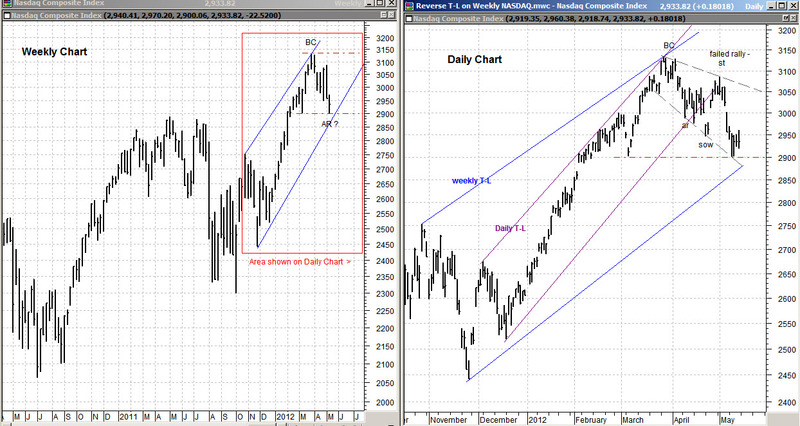 On a Daily time frame (right chart) we note weakness. The daily Trendline (purple) has been broken, a rally has failed to reach the previous level and we’ve made new lows. These are signs of near term Distribution / Selling. Note that we are right at the 2900 level of Support. I believe that level to be important in the coming week. If we break that level, we will likely also break the Weekly Trendline and further weakness is likely. But IF we hold that level, we could be building a base to move higher. Interesting times right now. Many ideas to investigate after these conferences, so off I go. A short note: What’s doing well? Short (sell): most non-US markets especially developing markets, Long: BioTech and Telecom, Real Estate is “OK”. The rest I’m concerned about in the short-term. This looks like a good time to be patient.